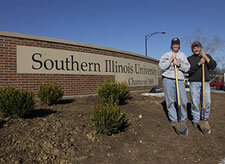 Plant & Service Operations (PSO) has the largest departmental workforce on the Southern Illinois University Carbondale campus. PSO is a division of the Vice Chancellor for Administration & Finance at SIUC, and its primary purpose is to provide operational services of various types to the faculty, staff and students. Our commitment to the University community is to continually provide the SIU academic, administrative, and student community with quality services that exceed customer expectations in a responsive, professional, friendly and courteous manner at competitive costs. Our diverse and skilled workers are dedicated to this commitment.